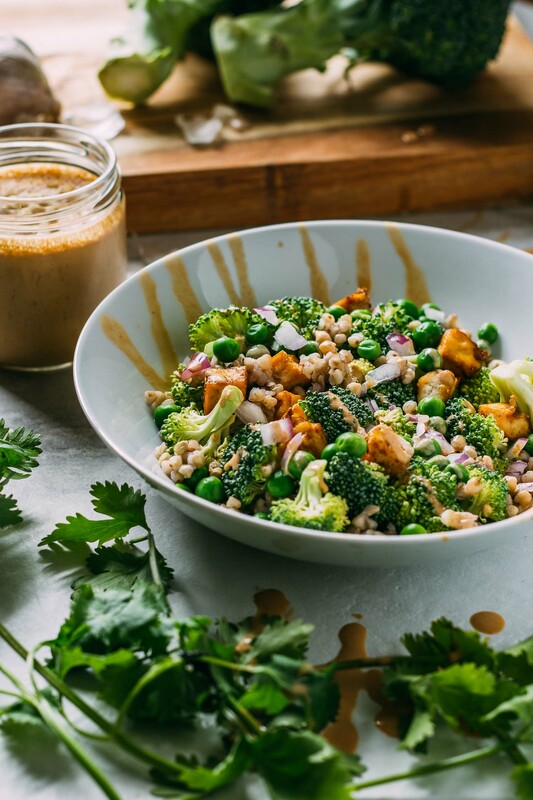 Our Peanutty Broccoli Buckwheat Bowl brings exotic Asian flavors straight into your down-home style bowl of nutritious and familiar staples. There’s never been a more straightforward recipe that delivers such authentic loads of flavor. 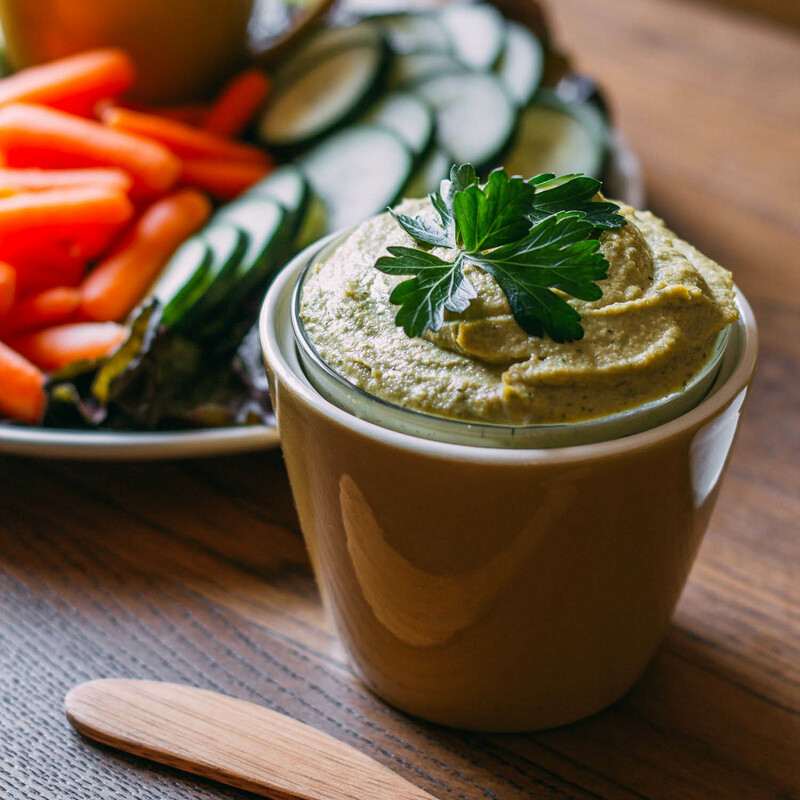 To top it off, it’s incredibly easy; there are only five ingredients plus a simple Thai Inspired Peanut Tahini Sauce & Dressing. So grab your fork and get ready for an amazingly satisfying serving of delicious, nutritious, heartiness! 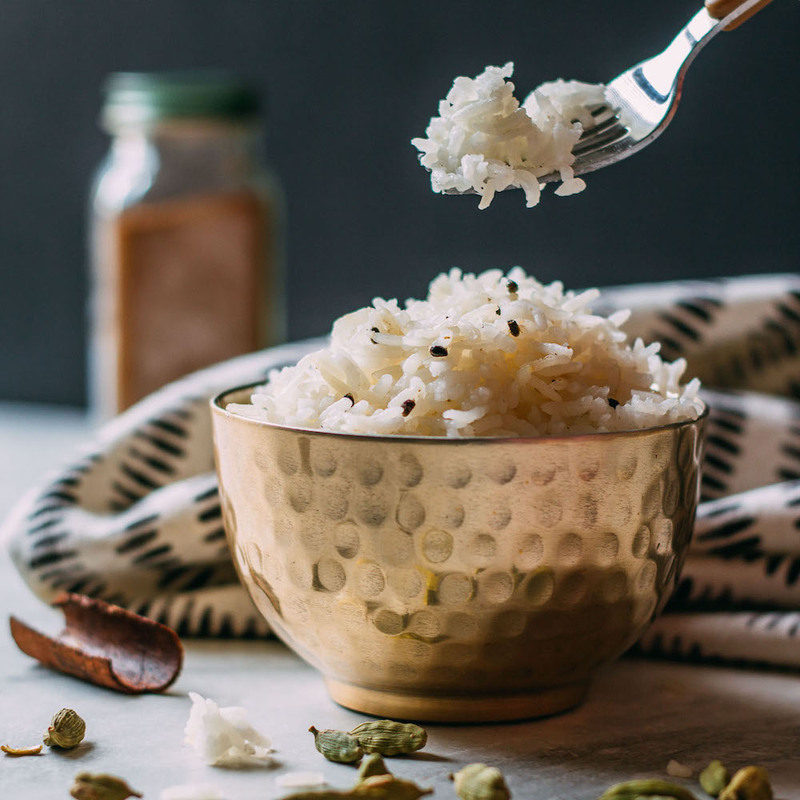 If you like, you could serve this bowl with quinoa, rice or noodles in place of the buckwheat. 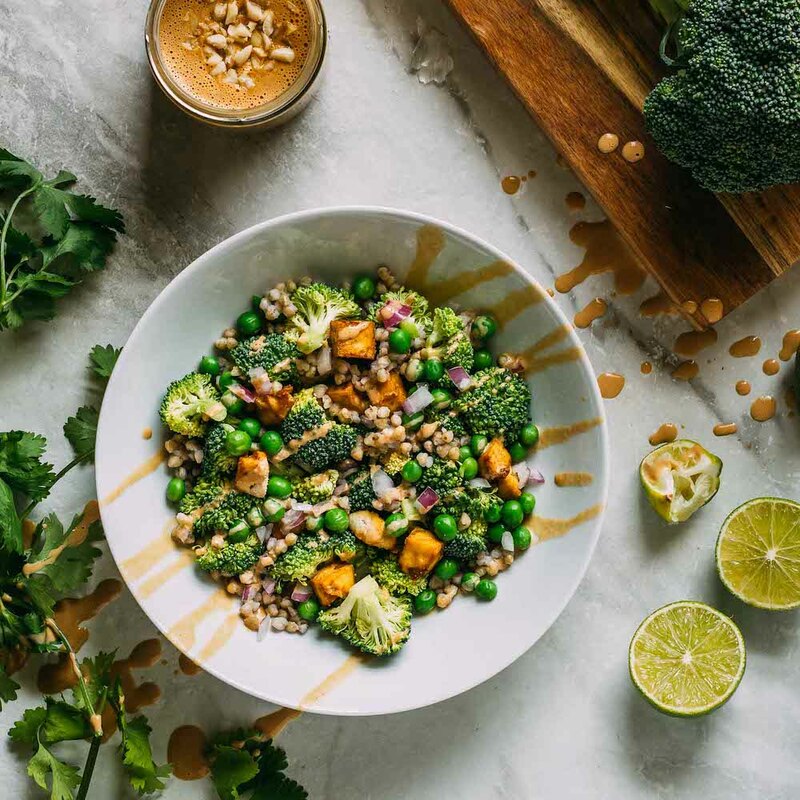 One aspect of this recipe that makes me see five stars is that our Peanutty Broccoli Buckwheat Bowl is as versatile as versatile gets. Change out the buckwheat (which is actually a seed) for a grain, change out the broccoli for another veggie. Switch out the type of onion, change out the peas for corn… you get the idea. You know how most of us struggle with change? Regarding changes, well, this bowl welcomes them! In case you’re curious about why we chose to feature buckwheat groats rather than a traditional grain as most bowls do, we’ve gathered a few facts about the somewhat less common grain. Many people, including us until just a few short months ago, think that buckwheat is a cereal grain. As it turns out, buckwheat is a fruit seed that is related to rhubarb and sorrel making it a smart substitute for grains for people who are sensitive to grains that contain protein glutens. So, buckwheat, since it is not a grain, is entirely gluten-free without worry. Buckwheat is a favorite choice among plant-based and gluten-free eaters since it provides a high source of amino acids, vitamins, minerals, and antioxidants as well as few calories and practically no fat! If you would like to know more about the benefits of including buckwheat in your diet, check out this article. Should we revisit the nutritional benefits of broccoli real quick? We love those little trees of green goodness, don’t you? And as it turns out, the fun treetop looking part of the broccoli is also the most nutritious! Broccoli seeds and florets have the highest proportion of bioactive compounds compared to broccoli stalks. Additionally, florets provide two to three times more health-filled glucosinolates and about twice as many polyphenols compared to the stems. Now, that’s a mouthful that we can’t wholly explain since we’re not scientists or nutritionists. This article, however, explores the subject of broccoli nutrients a little further and is very easy to understand. So, let’s talk about taste, shall we? After all, since you’re reading this because you’re probably planning to try the recipe, we’d like you to have an idea of what to expect with that first delightful bite. If you ever had one of those boring mayonnaise-heavy broccoli salads from the deli swimming in oily white sauce with barely another color or texture to be found in the entire bowl, you’re in for a pleasant surprise! Peanutty Broccoli Buckwheat Bowl is NOT another mayo-drowned salad, and it’s anything but boring. So gather your broccoli tops and chop up that onion, it’s time to make a, nothing short of heavenly, Peanutty Broccoli Buckwheat Bowl! 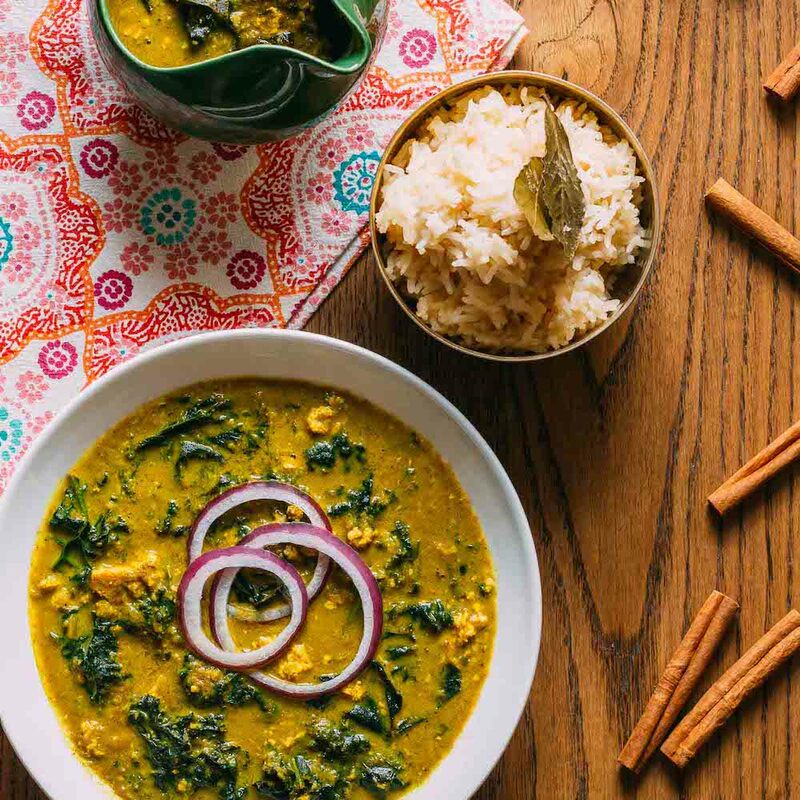 And if you love Thai inspired flavors as much as we do, be sure to check out our recipe for a delicious Mango Cashew Collard Wrap that also pairs perfectly with our Thai Inspired Peanut Tahini Sauce & Dressing. 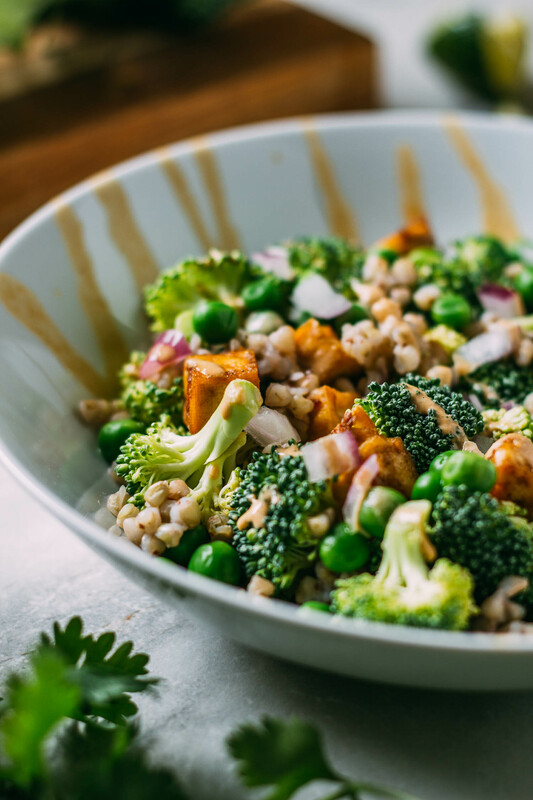 Getting your family or yourself to eat your broccoli will be no problem when you make our Peanutty Broccoli Buckwheat Bowl. It has all the makings of a dish that’s sure to become a favorite because the entire family will love it… even your little ones. The nuggets of tofu are addicting… watch out for that… you’ll never see it coming, but it’s true! And every bite is oozing with hints of peanut butter, so it’s a pleasure to devour! And since you likely appreciate Thai inspired flavors as much as we do, be sure to check out our recipe for a delicious Mango Cashew Collard Wrap that also pairs beautifully with our Thai Inspired Peanut Tahini Sauce & Dressing! 1 cup of raw buckwheat groats, 2 cups cooked - We like this brand of buckwheat groats. First, make a batch of Thai Inspired Peanut Tahini Sauce & Dressing. Thaw the frozen peas and allow to drain while you prepare the rest of the ingredients. Press and drain one block of extra firm organic tofu. Once the tofu has drained, slice in half, lengthwise, so that you have two rectangular slabs of identical size. Slice the two pieces of tofu into bite-size cubes. Arrange the cubed tofu on a parchment lined sheet pan, sprinkle with garlic salt and bake at 400º Fahrenheit for 15 minutes, flip and finish baking until the tofu reaches your desired crispiness but not more than another 5 to 15 minutes, max. While waiting for the tofu nuggets to bake, prepare one cup of buckwheat groats according to package instruction or as you usually prepare rice. Bring the two cups of liquid to a boil, pour in the groats, stir, bring to a boil, turn down to a simmer and cover and cook for about 15 minutes or until the liquid is absorbed. Remove from heat, remove the lid and set aside. As the tofu bakes and the buckwheat groats simmer, chop the broccoli florets into manageable bite-size pieces and dice the red onion. 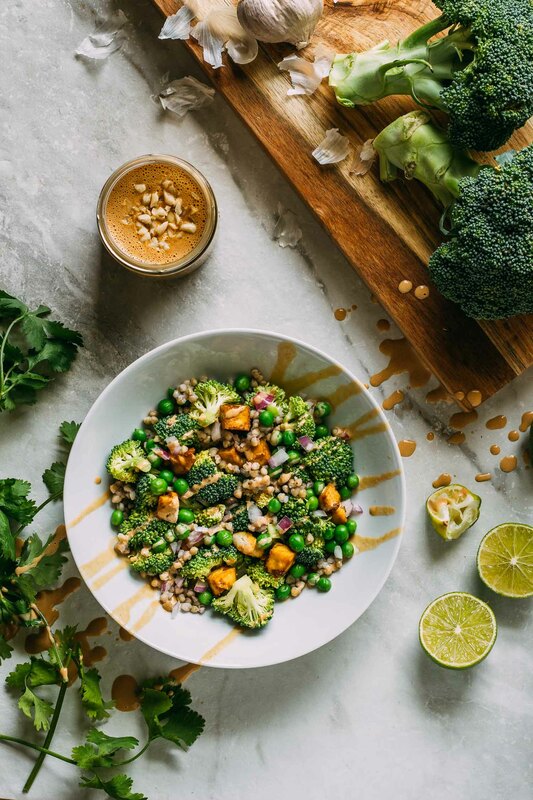 Put the prepared raw broccoli and diced onion in a large mixing bowl and combine with one cup of Thai Inspired Peanut Tahini Sauce & Dressing. Transfer the sauced up broccoli into a serving bowl or bowls. As an alternative way to deliver the sauce put the sauce in a squeezy bottle and create a drizzle across the bowl ingredients as the last step. We used the drizzle method in our photo. Fluff the cooked buckwheat groats with a fork and tenderly scatter across the broccoli mixture. We like to think of this step as scattering pearls... let them roll wherever they want. Now, top the broccoli and groats with the bite-sized nuggets of baked tofu and enjoy the magnificently layered umami of this simple and satisfying salad or bowl!